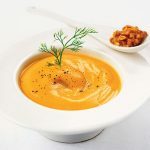 If you are after a quick and easy sweet potato soup recipe, you will love this recipe for Cream of Sweet Potato Soup which comes from the book Cooking with Turmeric (by Garance Leureux). The recipe is vegetarian, vegan and really simple. This recipe is great if you want to use turmeric in your cooking more often since the main spice in it is, guess what, turmeric! Turmeric is such an amazing natural remedy with an endless list of health benefits – it’s not only known to prevent cancer and heart disease, but it’s also a great anti-inflammatory that can be used for joint pain relief and even as a possible treatment for Alzheimer’s disease. 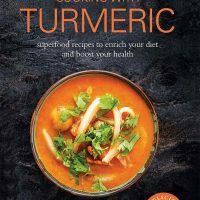 I always wanted to include more turmeric recipes in my diet but I just didn’t know how to use turmeric, apart from in lentil soup or when cooking brown rice! However, there are so many different ways of adding more turmeric to your diet and introducing some new healthy recipes is just one of them. The book, Cooking with Turmeric has been sent to me by a PR company so that I could see whether there were any recipes in the book that I wanted to share on my blog (I received a free copy). 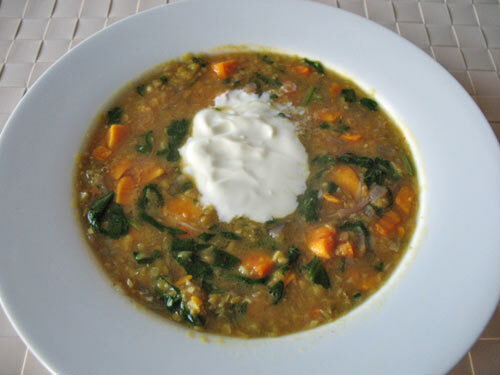 And yes, there were many healthy recipes in this book but I decided to pick Cream of Sweet Potato Soup recipe and that’s just because I love soups and I would eat them any time of the year, not only in winter. Besides, sweet potatoes are so good for you, packed with beta-carotene which converts to vitamin A in the body (amazing antioxidant, great for your eye health!). This sweet potato soup is so easy to make and doesn’t require many ingredients. It’s not only unbelievably healthy but it’s gluten-free too, and dairy-free! So great for those with sensitive stomachs. Not to mention that it’s totally vegetarian, vegan actually. The soup is creamy but not from dairy products, the creaminess actually comes from an oat flour which is used to thicken the soup. The recipe doesn’t have ‘salt’ in the list of ingredients, but I would definitely add it. It’s up to you of course and if you think it doesn’t need any salt you can skip it! 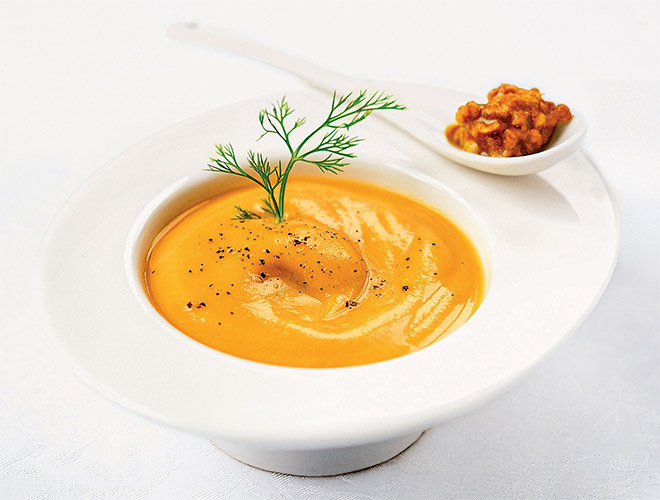 Make this sweet potato soup in the evening and have it the next day at work. I would be tempted to add some beans to it for some protein and of course, the best way to eat this soup is with some crusty bread. Yum! What spices go well with sweet potato soup? 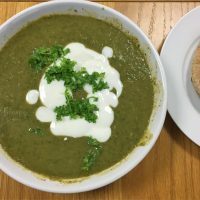 In case you were wondering whether you can use other spices (apart from turmeric) in this vegan soup, yes, of course, you can! Sweet potato is very similar in flavour to carrots, so the spices you would use in carrot soup would work well here. For example, you could go for a pinch of nutmeg, some cumin and chilly flakes (or you can use one fresh, chopped red chilli). If you like your soups quite spicy, just add some curry powder and if you like, a bit of ginger and cayenne pepper as well. You could also experiment with ground coriander. What spices you use in your sweet potato soup really depends on your preferences. It’s not a bad idea to experiment with different spice combinations and then see which one is your favourite. Blend in a food processor. Pour the soup into a pan with the water and, over a gentle heat, stir in the oat flour. This will give your soup a deliciously thick and velvety texture. Leave to simmer for 5 to 10 minutes. 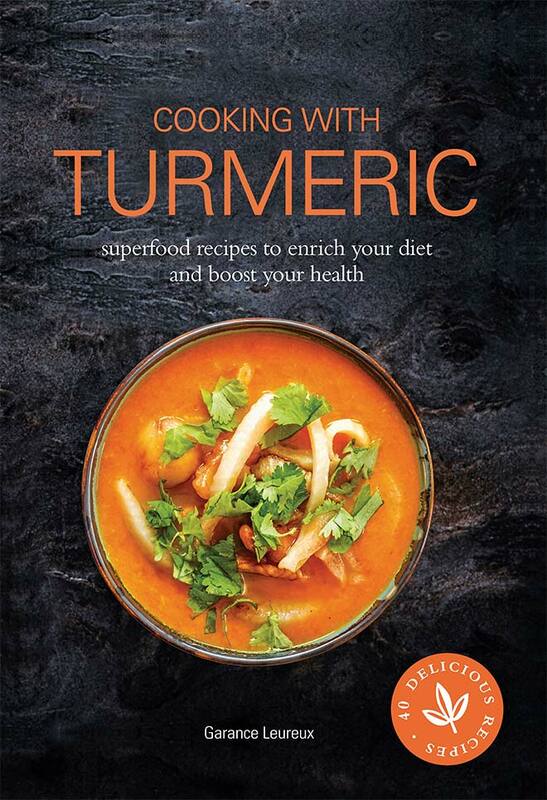 If you like this soup and want to introduce more turmeric recipes into your diet, then you may consider buying Cooking with Turmeric book (RRP: £8.99, Modern Books, available from Amazon). The book contains 40 delicious recipes ranging from spice mixes, oils, drinks, salads to smoothies and cakes.